Sounds of an Era is an addition to our Home Page under BourdaMarketPlace.com. It features orchestras and performances that were pioneering in many respects. 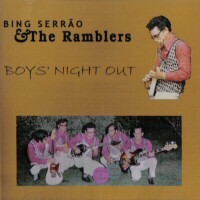 The newest release in that category is BOYS NIGHT OUT a digitally remastered recording from a Bwee supported recording. (A vinyl copy was being auctioned for over $100.) This recording is superior and a fraction of that price. The Serrao Brothers were available to ensure that the digital recording kept the original authenticity of their artistry. Proof: the bonus pan track recorded July 1960.